Please call our cruise consultants on (612) 8296 7362 to book over the phone & pay by credit card. Visit our office at King Street Wharf 5 to and book & pay with cash. *Indicative beverage list only. Items may be subject to change. * Australian Cruise Group strictly adheres to NSW Responsible Service of Alcohol guidelines. This is not an unlimited beverage package. We request our guests to drink responsibly, enjoy alcoholic beverages in moderation and consistent with the concept of the cruise. You will be refused service by our crew on board at their absolute discretion if you do not comply with any reasonable request consistent with the NSW liquor license regulations and our house policy. * Requests for dietary (gluten-free, nut-free, dairy-free), substitutions and modifications of menus on board our cruises will be politely declined, as we have an on board kitchen and our kitchen team is required to serve the menus within a required time period, of the respective cruises. All our cruises have at least one vegetarian menu option for seated & served menus and buffets also offer vegetarian choice. We cannot guarantee that certain products or ingredients (halal, nuts, gluten, dairy, etc.) will not be in our food, and we explicitly accept no liability in this regard. For serious food allergies you must make your own decisions on selecting meals. Our staff’s comments are only to assist you in making an informed decision. To ensure your Clearview dinner experience is a quality dinner cruise, we request your cooperation in adhering to the minimum dress code. MEN are requested to wear collared shirts and pants. Gentlemen are not permitted to wear sleeveless clothing or shorts on dinner cruise. WOMEN are encouraged to dress appropriately to attend a dinner at a quality restaurant. Playsuits and other inappropriate clothing should be avoided. STRICTLY no athletic wear (tracksuits or sweat pant and hoodies) thongs, singlets or beach wear. You will be refused boarding if you are not dressed appropriately (at the discretion of the Cruise Director and the Captain) and do not meet the decorum of the cruise. Refund will only apply to the refused passenger, not the whole group. If the whole group decide to disembark, they will not be refunded on this basis. Any person within a group who is refused boarding due to inappropriate dress code, as per the discretion of the captain and Cruise Director, will be offered a refund by our office as soon as possible within 3-4 business days of cruise date – unfortunately, boat staff cannot refund in cash or card on board. We appreciate your total cooperation in the interest of all passengers on board. * Indicative menu only. Menu may be subject to minor changes. Welcome to Cruising Restaurants of Sydney, home to exceptional dining cruise experiences on Sydney Harbour. Cruising Restaurants have redefined dining experiences on Sydney Harbour ensuring that quality dining is no longer confined to waterfront restaurants. Quality dining is no longer confined to waterfront restaurants in Sydney. Cruising Restaurants of Sydney have redefined the experience of waterfront dining with 'value for money' being at the core of its principles. We offer a choice of 3 impressive and comparable Sydney restaurant dining experiences that capture the essence of waterfront dining with great food and stunning harbour views. Whether it's a Friday night wind down, a breezy Sunday lunch, a formal business lunch or client entertainment that you have in mind, our restaurant experience promises to exceed all your dining expectations. Our chefs on board prepare an array of dishes that will tantalise your taste buds with bold and innovative flavours. We aim to create special menus that can be enjoyed by all, foster a luxurious and exciting environment onboard and give our guests the best of Sydney's harbour delights on a cruising platter! So, choose Cruising Restaurants of Sydney and discover the spectacular side of Sydney dining with exquisite ambience, beautiful décor, delectable food and seamless service. A guaranteed 'value for money' dining experience! *Indicative menu only – items may be subject to change without notice. Create innovative menus that offer a variety of dishes that will appeal to all guests. Ensure all dishes are freshly prepared by our chefs using fresh and seasonal produce. Serve large portions to deliver a 'value for money' dining experience for our guests. HOW DO I CHECK AVAILABILITY FOR THE RESTAURANT? You can check availability for any of our products by clicking on the book now button for each product. This will take you to our online reservations system. Please enter the desired date and the number of tickets you wish to purchase. This price displayed is dependent on the number of seats available - so if you check availability and come back a couple of days later you are not guaranteed to recieve the previously displayed price. The price on the internet is the best available price across the business. CAN THE PAYMENT BE MADE VIA CASH, CHEQUE OR DIRECT DEBIT? We do accept these other methods of payment; however, only credit card is available for online bookings. If you would like to pay by cash, you are welcome to come to any of our ticket offices around Circular Quay and Darling Harbour to make your booking. If you would like to pay via cheque or direct deposit, this must be done at least 4 days prior to your booking date. WHERE IS THE CLOSEST PARKING STATION? Secure Parking offers two great parking stations close to King Street Wharf. 1. 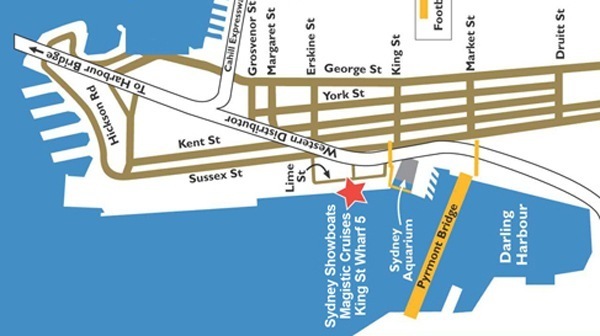 King Street Wharf Parking on Shelley Street is the closest parking available. 2. Another nearby parking station is 321 Kent Street with an approximate five minute walk to King Street Wharf. Parking rates are available on the Secure Parking Website. WHAT IS THE DRESS CODE FOR OUR CRUISING RESTAURANTS? Our Cruising Restaurants have a smart casual dress code (e.g trousers, collared shirts, dresses or jeans). Our special events cruises range from smart casual to formal, so feel free to dress up for the occasion. DO CRUISING RESTAURANTS CATER TO ANY SPECIAL DIETARY REQUIREMENTS? We will make every effort to cater to your dietary requirements and allergies including vegetarian, halal and gluten free. We have a dedicated Executive Chef who is flexible in catering to most special requirements. However, please submit any special requests at least 3 days prior to your cruise date. Please contanct us on (+612) 82967200 for any special request or alternatively please send us an online enquiry form. Please note: due to the large operation, we cannot give a 100% guarantee that certain ingredients will not be in our food and the company explicitly accepts no liability. For serious food allergies, we advise our customers to make their own decisions on selecting their meals. Our staff comments are only to assist you in making an informed decision. In exceptional circumstances, if you or one of your guests wishes to bring their own meal we are happy to accommodate them. There is strictly no BYO alcohol on our cruises. Beverages can be purchased on board from our fully licenced bar or a beverage package can be purchased. A beverage package entitles you to a selection of beer, wine, soft drinks, juices & mineral water for the duration of the cruise. Keep it simple, keep it fresh! All you want to know and more! * Indicative menu only – items may be subject to change without notice. Enjoy Sydney’s most premium dining cruise experience on board an all-glass cruising restaurant that affords 360° roving views of Sydney Harbour’s spectacular sights. Clearview Cruises, with its luxury interiors, unique dining concept and outstanding service, has completely redefined the luxury dining experience, which will soon make dining at waterfront restaurants passé! The cruise is not available to guests below the age of 18, including infants, for no reason other than maximising guest comfort and maintaining the exclusivity of dining ambience. Canapés and drinks are served on the Sky Deck that has a retractable roof, allowing you to leisurely take in the illuminated harbour skyline and the well as the magnificence of the Harbour Bridge and Opera House! This is followed by a seated and served multi-course dinner in the air-conditioned dining saloon that boasts views that are just as beautiful, thanks to its all-glass surrounds! And, if you happen to be cruising on a Saturday night, there will a songstress, live music and dancing to entertain you! *SMART DRESS CODE APPLIES. Please Click Here for specific details. Magistic Cruises strictly adheres to NSW responsible service of alcohol legislation. Magistic Sydney Harbour dinner requires minimum numbers to operate and if minimum numbers aren't reached then you will receive a complimentary upgrade to the Sydney Showboat Dinner. Enjoy a different dining experience on board the Magistic cruising restaurant. Dine on a $5M luxury catamaran with a spacious air-conditioned dining saloon lined with panoramic windows and enjoy a freshly-prepared buffet that has something for every palate. A selection of beers, wines and soft drinks are also included for the duration of the cruise. After dining the Magistic way, you’ll find that no regular waterfront restaurant lives up to this experience. Enjoy the sunset and watch the city lights come on, illuminating the Sydney skyline as well as the Harbour Bridge and Opera House – the harbour’s main attractions! There are no set menus or measly portions – you have an unlimited buffet spread with a variety of international dishes. You will definitely be spoilt for choice on what to take from the buffet station to your personal reserved table. You can also choose your drinks from our beverage list to complement your dishes at no extra cost. The buffet is open for 90 minutes giving you ample time to enjoy the views and come back for a second, or maybe, even a third helping. After your dining experience on this contemporary cruising restaurant, you won’t be heading to a traditional waterfront restaurant any time soon, as dining is more special on a Sydney Harbour dinner cruise, even more so, when drinks are included. Also, you can choose the alfresco dining upgrade and enjoy roving Sydney Harbour views while dining for just $20. We strictly adhere to NSW Responsible Service of Alcohol guidelines and house policies are strictly enforced. Serving its clients for over 15 years, Magistic Cruises has raised benchmarks for cruising in Sydney. Popular with travellers and locals alike, this 2-hour Magistic Express dinner cruise incorporates a freshly prepared buffet and premium beverages topped with roving harbour views. Once on board the multi-million dollar catamaran, the cruise director will usher you to your reserved table inside an air-conditioned dining saloon. Savour your treats in leisure, as the buffet and beverages are available for 90 minutes and are frequently replenished. To enhance your experience, walk along the expansive outer decks for continuous views of the splendid Sydney horizon and its attractions! These inclusions make this dinner cruise an ideal setting for all events, from birthday celebrations to romantic dinner nights! Cruising Sydney Harbour for over 15 years, Magistic Cruises has elevated the standards of cruising in Sydney. A hit with tourists and locals alike, go on board this 2-hour Magistic Express dinner cruise and enjoy a freshly-prepared unlimited buffet with seafood options, alongside roving harbour views. Cruise on a multi-million dollar catamaran and sit down at reserved table in an air-conditioned dining saloon. Relish your treats in ultimate luxury, and with the buffet available for 90 minutes and are frequently replenished, there’s no need to hurry. To add more to your night, stroll the expansive outer decks for uninterrupted harbour views of the splendid Sydney night sky and its attractions! You can also choose to purchase beverages from the fully-licensed bar on board. An ideal venue perfect for all events right from private parties, birthday celebrations and romantic dinner nights, this cruise is sure to offer a memorable experience to all aboard! Order from the wine list onboard or purchase a beverage package for $25 and enjoy all of the below beverages for the duration of the dinner cruise. Hardy's Sauvignon Blanc - Reynella, South Australia (A lovely wine displaying crisp fruit flavours. An ideal wine to accompany most meals. Please note that whilst we are delighted to welcome well-behaved children on board our vessels/cruising restaurants, we do not provide high chairs due to safety reasons. If you have infants, like an airline, you must book and pay the relevant price and declare at time of booking, as they must be included in the manifest. If infants are booked, we will facilitate extra space for stroller or pram on request. If there’s a restaurant in Sydney with a difference, then it’s the glamorous Sydney Showboat that relives a bygone era with its old world splendour. This authentic paddlewheeler that sets sail from Darling Harbour takes you back to a time when glamour, charm, romance and chivalry were the order of the day. The Sydney Showboat promises a night full of spectacular entertainment, a fantastic three-course seated and served dinner and a premium selection of beverages for the duration of the cruise. As glamourous showgirls, in glittering beaded outfits, usher you into the Showboat restaurant, you’ll find yourself entering a sensational world of glitz and glamour. A dining destination like no other, this cruising restaurant offers its guests an elaborate, perfectly balanced three-course dinner, prepared by innovative chefs who intelligently combine fresh produce and popular flavours. Seated at a table with crisp linen, polished silverware and sparkling glassware, your every need will be attended to by courteous staff. You can begin your evening with refreshing beverages that you can choose from our beverage list. You can place your beverage orders with our waitstaff and pay for the same at the end of the cruise. You should definitely make the most of your time between courses to step out for a breath of fresh air and enjoy a long leisurely stroll along the expansive outer decks of the Showboat, taking in the gorgeous views of Sydney Harbour and its star attractions. What’s more… the highlight of your evening! An all-Australian cast of singers and dancers will perform a spectacular cabaret show called ‘Voyage of Love’ exclusively for diners aboard the Showboat. The Showboat dinner cruise definitely sets the stage for a memorable evening; an experience that is unmatched by other restaurants in Sydney! 1 hour International show – now showing "VOYAGE OF LOVE"
Table magic and magic show by famous "Mr Showboat"! If unique dining experiences are what you crave, then a Sydney Showboat dinner cruise, inclusive of drinks and a live cabaret show, will be right up your alley. Experience dining at neatly set tables laid with crisp linen and polished silverware on board an authentic paddlewheeler. Nothing can beat the old-world charm of the Showboat dinner cruise on the Sydney Harbour! Your cruising restaurant is an authentic paddlewheeler with cathedral windows and wrap-around verandas that offer the best views of the Sydney skyline. Despite being a period vessel, the Showboat is air-conditioned and has all the modern amenities to ensure your comfort is not compromised in any way. As you are seated at your individual reserved tables for the night, you are treated to a 3-course gourmet meal freshly prepared by our chefs on board. You can order your drinks from a selection of beer, wine and soft drinks at no extra cost. In between courses, step out on to the long outer decks and take in the splendour of Sydney at night time as the skyline sparkles in all its glory! If you thought that was the end of your Showboat dining experience, think again! After dessert, the ‘Voyage of love’, a one-hour spectacular cabaret show performed by an all-Australian cast of singers and dancers, takes centre stage! Sydney Showboat relives a bygone era with its old world splendour and elegantly combines dining to give you an evening to remember for a long time! The beverage package includes all of the beverages listed below for the duration of the lunch cruise. When you book a 2-hour lunch cruise, you have the option to upgrade for a 2-hour cruise extension at just $17.50 (original price valued at $35). Please Note: The cruise extension only includes sightseeing and food will not be served during this interval. The vessel will have three stops; King Street Wharf between 2pm-2:15pm; Circular Quay between 2:35pm-2:45pm and a short stop at 3:45pm. The additional stops are to facilitate the boarding and disembarking of our 2-hour & 1-hour sightseeing passengers. Treat your partner, friends or colleagues to a novel restaurant-quality dining experience aboard our luxurious catamarans, the Magistic Two. The Magistic whisks you away on an impressive Sydney Harbour buffet lunch cruise, giving you a dining experience that is relaxing, at the same time exhilarating! Waterfront restaurants in Sydney are dime a dozen, but none quite as extravagant as the Magistic that exudes ambient luxury and finesse in every aspect. Magistic elevates the experience of dining by the Sydney waterfront with meticulous attention to detail aboard its floating restaurant. The dining saloon is spacious and enhanced with sleek and contemporary décor, not to mention the panoramic windows that boast fantastic views of the harbour. You can begin the afternoon with refreshing drinks from a wine list that includes beer, wine, sparkling wines, cocktails, spirits, soft drinks and sparkling mineral water. Sip on these refreshments as you leisurely stroll the decks, feasting your eyes on the splendid sights that pass you by. Then, prepare to tuck into a fresh and scrumptious buffet that is a delightful mix of local and international cuisine. With an array of contemporary salads, mains and desserts, there is definitely something delicious for both the sober and adventurous palate. The buffet is open for 90 minutes, giving you ample time to enjoy your meal at leisure. The Magistic luxury Sydney Harbour Christmas Party cruise is for two hours, but guests have the option to disembark after this or continue on an exclusive two-hour sightseeing cruise at an additional cost of just $17.50. Also the cruise extension only includes sightseeing and food will not be served during this interval. Sydney Harbour may be home to a lot of restaurants and cafes, but they all pale in comparison to the dining experience Cruising Restaurants has to offer! Sydney Showboat Cruising Restaurant offers a truly unique and stunning Sydney Harbour experience. Your dining experience will combine a restaurant style three-course dinner with a world-class cabaret show performed by an all-Australian cast of the highest calibre. 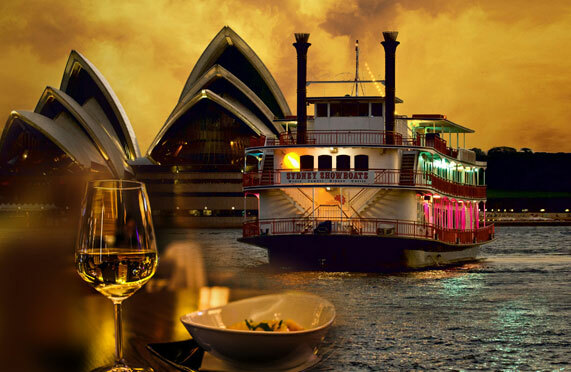 Magistic Cruising Restaurant has redefined dining experiences on Sydney Harbour since 2001. Quality dining is no longer confined to waterfront restaurants. You can dine out on the harbour in an elegant and contemporary setting, opting for an all-inclusive package that guarantees value! abn: 89 152 554 302 | website is owned and operated by australian cruise group copyright © 2019. all rights reserved.